I found a small pile of quilt tops and backs in a wardrobe a few weeks ago. It's time that these were finished and sold. 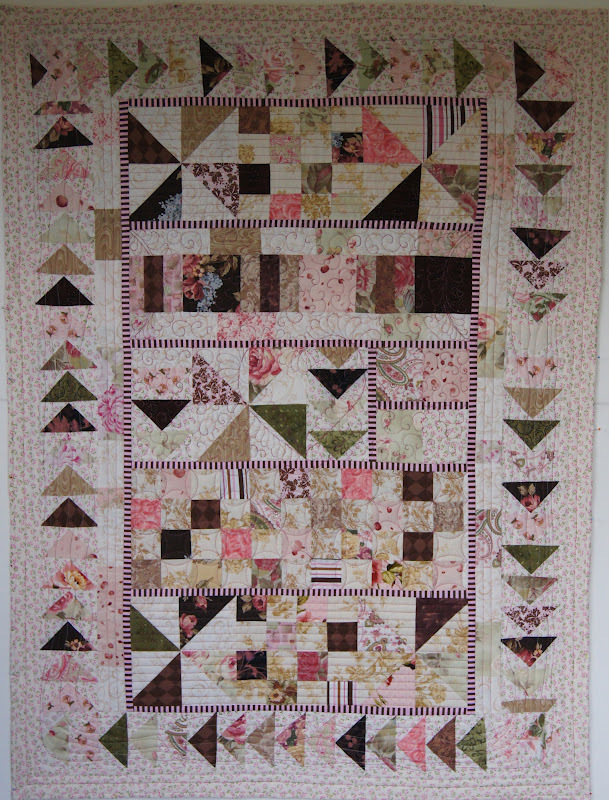 So here is one I have finally finished - the blocks were left over from a very large quilt I made a couple of years ago. Actually the original quilt was too big, and I had to take off the flying geese blocks along both sides - they have been used here. I used almost all of the fabric up including having it on the back. girl's lap quilt - measures 38" x 51.5"
Here is a close up of the quilting - I started with a feather heart just above the center, then quilted row by row. Off to do some sewing on a quilting group challenge quilt which needs to be finished by next month. Hooray!!! Congratulations on finishing it. I love the colours and the quilting designs. How much to buy?